You only need to spend two minutes online to find countless photos and videos of adorable pooches frolicking in swimming pools. From puppy pool parties to life jacket-wearing corgis diving bravely into deeper waters (and not to mention those clips of little puppers “swimming” even when they’re being held in the air), it’s clear that dogs love going for a dip. However, lots of dog owners are understandably anxious about how safe it is for their pooch to use a pool – particularly a deep, chlorinated pool that’s intended for human use. Well, we’re here to reassure you that the rules are essentially the same as keeping children safe around a pool. So, whether your pup loves getting in the water any time they can or you just want to know about letting them cool off on hot days, here’s a quick look at the biggest safety concerns and how you can keep your four-legged friend happy and healthy every time they swim. Is Chlorine Dangerous For My Dog? The biggest worry for most dog owners is how chemicals like chlorine might affect their beloved pet. In short, exposing your pup to chlorine is perfectly fine, but it’s a good idea to give them a warm wash once pool time is over to rinse their fur – just like you would with your own skin. That being said, do discourage your dog from drinking pool water as chlorine ingestion can lead to upset stomachs and worse. Best to stick to their bowls! 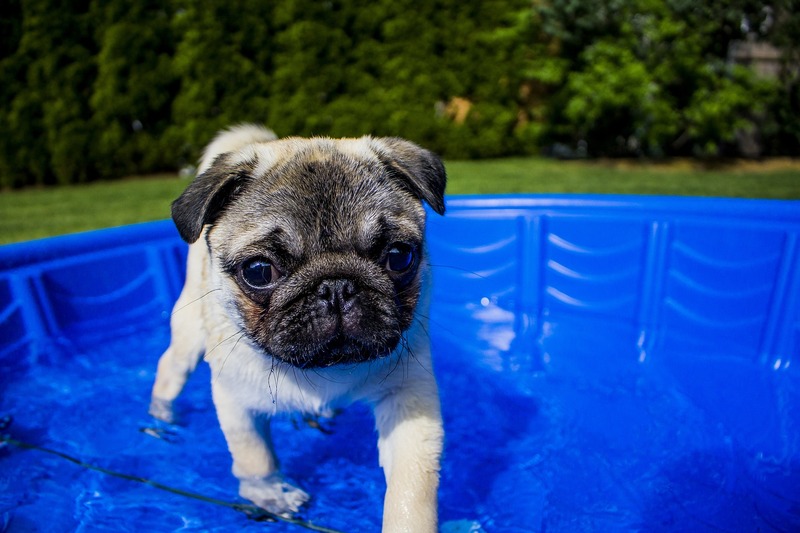 As an aside, do consider that letting your dog swim around in your pool will introduce a lot more bacteria into the water – especially if they are a bigger breed and are outside a lot. Extensive doggy use will result in you needing to put more chemicals into your water (and frequent filter cleans to eliminate dog hair) in order to keep the water hygienic. Can I Use Toys In The Pool? Absolutely! 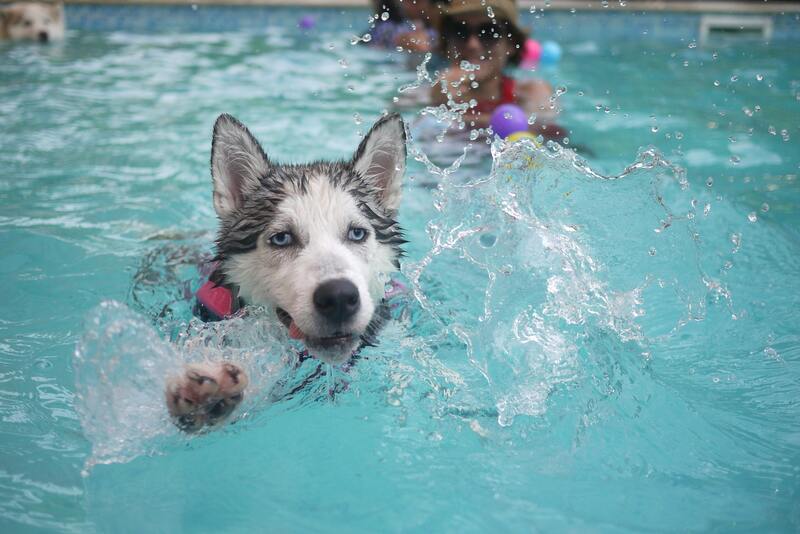 Playing in the water is excellent exercise for your dog, just like it is for humans. 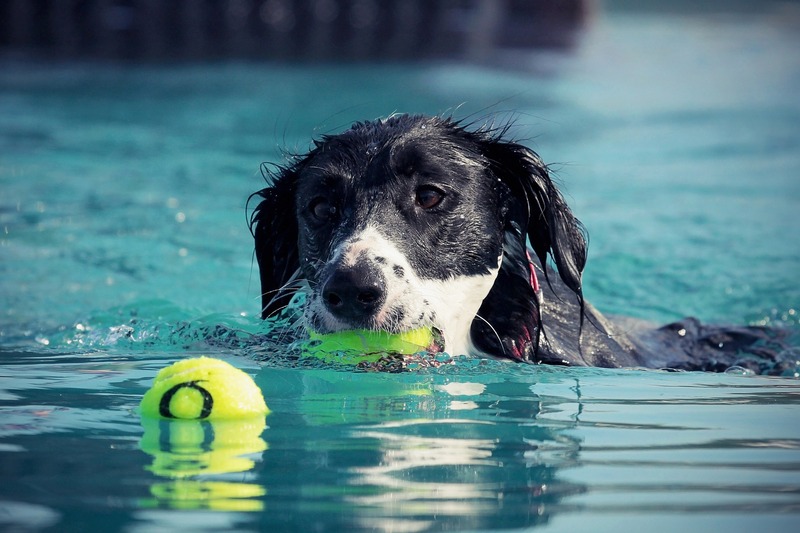 As long as your dog is a strong swimmer (find out more about non-swimmer breeds here), retrieving toys from the surface of the pool and beneath the water is fun, stimulating and safe for them. Once you’re ready to get out of the pool, make sure you take all toys with you. 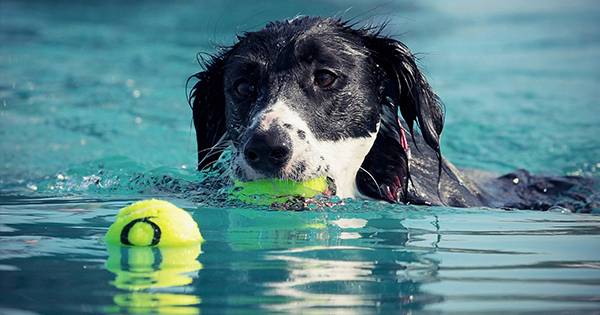 Whether it’s your playful pooch’s favorite ball or a rogue pool noodle that just looks like fun, any inflatables are going to tempt your dog back into the water when you’re not paying attention. You should also be careful about playing around the edge of the pool – if one of you falls in, it’s likely the other is going to be diving in after them! Is It Safe To Leave My Pool Uncovered? Taking of falls, remember that an open body of water poses a serious risk to your pets. An over-confident leap or a misjudged skid can easily land your pup in the water, which can become very dangerous very quickly, especially if your dog isn’t a natural swimmer. Ideally, you need to install a physical security barrier to prevent accidental dives. Depending on where you live, you may be legally required to erect a fence around the pool’s perimeter. If this is the case, routinely check the condition of the fence and discourage your dog from trying to dig underneath it. Always keep the gate closed when the pool isn’t in use. If you aren’t required to install a fence (and don’t want to), at least consider a solid pool cover that will prevent accidental falls with the added benefit of keeping the water cleaner and warmer! Will My Dog Be Able To Get Out Of The Pool? Of course, an accidental slip or jump into a pool is less of a threat when your dog can get themselves out of the water quickly and easily. For this reason, it’s absolutely key that you spend time training your dog in the pool so they learn where the exits are and how to use them. If the edge of your pool is flush (or at least very close) to the surface of the water, it will be easier for your pet to reach the side and pull themselves out than a big gap between ground-level and the water level. Bigger, stronger dogs will also have an easier time getting out without help. 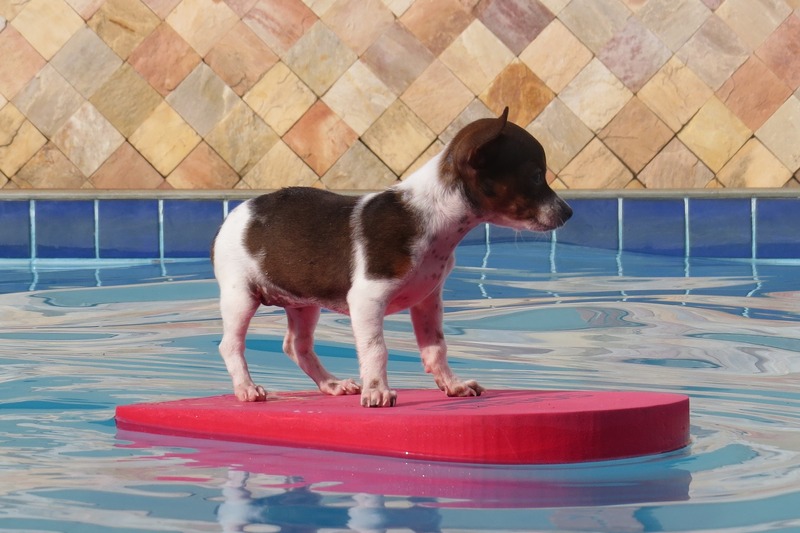 Proper steps (rather than a ladder) will be the easiest way for your dog to exit the pool, but investing in a doggy water ramp will provide a safe exit at any depth. These are simple devices that latch onto the side of the pool and dip into the water, so that your dog – whatever their size – can clamber up and out without assistance. For tips on how to choose a water ramp and more information about their benefits, take a look at this article. Can I Take My Dog In The Hot Tub With Me? No, no, no. Natural pools, saltwater pools and chlorinated pools are fine for your dog in sensible doses, however hot tubs are a big no-no. The higher temperature might be comfortable for humans, but is outright dangerous for your pooch as they cannot sweat and will overheat very quickly. Plus, compared to a pool, the additional chemicals required to keep a hot tub clean will be more likely to cause irritation and skin problems for them. If you want to enjoy a soak, try filling up a baby pool for them nearby, instead. Puppies and senior dogs will be weaker swimmers so keep an extra close eye on their energy and safety. Doggy life jackets are a good idea for all dogs, but particularly those that are less buoyant or are nervous in the water. More water equals a bigger risk, but stay vigilant during all types of pool play – even paddling pools and ponds. 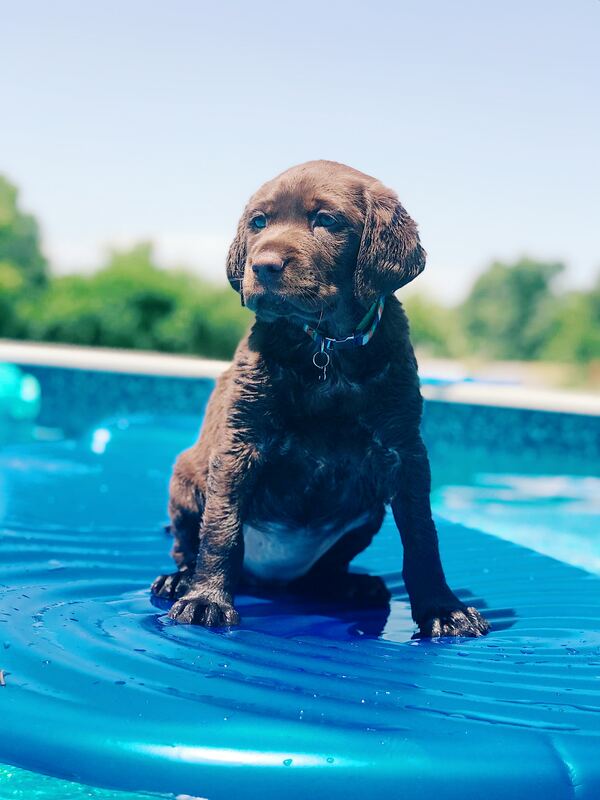 Hopefully, this has given you some information about how to make your pool as safe as possible for your pup, so you don’t have to worry too much and can concentrate on having fun!